Titian's Sacred and Profane Love: Titian: A study in character. The 'una nocte' (Night) surreptitiously removed from the studio of the late Giorgione. Titian: A study in character. The 'una nocte' (Night) surreptitiously removed from the studio of the late Giorgione. The most popular (yet by no means conclusive) interpretation of the Sacred and Profane Love's origin is that it was a gift from one Niccolo Aurelio to his bride Laura Bagarotto. There is no documented evidence of any contract or commission and all conclusions and assumptions are based solely on the existence of the Aurelio coat~of~arms at the front of the fountain. There is no doubt that it is the Aurelio coat~of~arms (see fig. 1) that is prominently displayed on the front of the sarcophagus next to the spigot, yet it has been suggested that Aurelio could not have afforded this painting and that if it were a wedding gift, only Laura Bagarotto's dowry could have purchased this commission. Laura's father Bertuccio Bagarotto was a professor at the Padua University who was publicly executed for treason against Venice during the War of the League of Cambrai (1508-16) and the Bagarotto dowry which had been confiscated by Venice was restored to Laura the day before her marriage to Aurelio. It seems Laura's father, Bertuccio was a victim of a pogrom against certain notable figures of Padua and was posthumously exonerated some time after these events. However the thought that Nicolo Aurelio used his new brides dowry to purchase the Sacred and Profane Love was dashed after the publication of Aurelio's will by the late Rona Goffen. (A very good summary of Aurelio which includes a reproduction of this will can be found here at Dr Frank's blog: Giorgione et al...). At this point then, it appears that Aurelio did not use the Bagarotto dowry to acquire the Sacred and Profane Love. If as is speculated here, the Night (una nocte & notte) that went missing from the studio of Giorgione and the Sacred and Profane Love, are one and the same painting, there was also a four year period in which the painting was missing, eventually reemerging as the painting endorsed for Aurelio which now included the Aurelio coat~of~arms. "...in the transcriptions of the documents relating to Giorgione's frescoes on the Fondaco dei Tedeschi, Nicolo Aurelio is always the signatory..." Anderson, p.233. The prominent coat~of~arms announces (as it was always intended to do) Aurelio as the ultimate possessor of the Sacred and Profane Love. 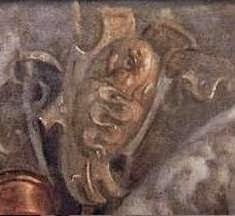 Historians agree - purely on the basis of that coat~of~arms - that Aurelio must have commissioned the painting, but if so, just how much and in what form of payment such an arrangement was to gain Titian remains unknown to this day. Of the many possibilities that might be propounded regarding Aurelio's acquisition of the Sacred and Profane Love -and if the suggestion that Aurelio could not have afforded this painting is even slightly accurate - one must look to other arrangements to speculate that which may have been of mutual benefit to both Titian and Aurelio. Aurelio's rise to a position of influence within the fertile culture of Venetian art was no doubt due to the types of patronage systems operating in the Venice of the Quattrocentro and Cinquecento. There were the guilds, (scuole), royal patronage, and both ecclesiastical and lay patronage. The Venetian state also pursued a system of 'patronage by committee', [Peter Bourke p. 101] that committee being the politically powerful Council of Ten. In a culture where success was ultimately reduced to basic financial equations, patronage by the Council of Ten could be viewed in contemporary terms as a prestigious and sometimes lucrative form of public recognition endorsed by a distinguished and powerful corporate collective. As the Secretary to the Council of Ten, Aurelio was definitely in a position of power and was most certainly 'connected'. 'A resolution accepting Titian's offer was carried (10 votes to 6); Bellini protested. In March 1514 the decree was revoked (14 votes to 1) and Titian's assistants were struck off the payroll; Titian protested. In November the revocation was revoked (9votes to 4) and the assistants reappeared on the payroll. It was then reported that three times as much money was spent as need have been, and all arrangements were cancelled. Titian made a new offer, which was accepted in January 1516: he was to have only one assistant. The battle scene was still unfinished in 1537." Bourke, P. pp. 101-102. Why, three years after the death of Giorgione, would Bellini desire to deny Titian a particular commission that Bellini himself did not seem to covet? What might it be that had so roused the ire of Bellini toward his former pupil? 'In November 1514 Titian was given an undertaking that he would inherit Bellini's senseria if he had not already obtained another in the normal course of events.' Hope. P.38. Titian's only surety is that he will inherit the position upon Bellini's death, which is simply another way of saying that the one, singular obstacle to Titian's ambition was Bellini. This seems a rivalry 'to the death' and bears the hallmarks of a protracted feud between the two rather than some trifling squabble. After Bellini's death Titian's offer was resubmitted and of course, accepted. The argument against this scenario is that Titian was already famous and after the death of Giorgione and then Bellini in 1516, he was one of the most talented painters in Venice. But as the date of Titian's birth is currently considered to have been c.1488-90, his promotion to the official role of 'Painter to the State of Venice' contrasts dramatically to Bellini purely on the basis of age: Bellini rose to the position at 54 years of age whereas Titian was probably around 33 years old. "With an insistence painful to the sensitive, the aged Titian collected money from all sides, and finally, in 1569, he persuaded the Venetian authorities to transfer his senseria - the brokers patent which had been awarded to him more than fifty years before and carried an annual stipend of one hundred ducats as well as sizable tax exemptions - to his devoted son Orazio...". Is the real reason that Bellini sought to foil Titian's ambitious schemes knowing that Titian had conspired to remove a 'night' (the Sacred and Profane Love) which was destined for another from Giorgione's studio and authenticated it to broker a deal with Niccolo Aurelio; a deal worth one hundred ducats a year, sizable tax exemptions, plus the guarantee that he would inherit the prestigious role of Painter to the State of Venice? What was the cost of the Sacred and Profane Love to Aurelio? Where would Aurelio secure the finance to afford the Sacred and Profane Love? There is every chance that Aurelio never had need to part with a penny, and even with the privileges and advantages that came with the senseria, the price of reworking the painting was negligible, after all it had been described as 'very beautiful and singular' by Isabella to her merchant, so it must have been at a stage of near resolution. No wonder the embittered Bellini was foiling Titian ambitions in the trials with the Council of Ten. Had Titian only held the official position for one year he would have made 100 ducats (Giorgione was paid 150 ducats for the entire Fondaco murals -see Giorgione et al). 100 ducats a year over 35 years is of course 3,500.00 ducats. Not bad work if you can get it... and the 'sizeable tax exemptions' should not be overlooked. Titian positioned himself as the 'rival' to both Giorgione and later to Giovanni Bellini where he believed himself to be the obvious heir apparent to the Bellini senseria and Aurelio was in a position to positively guarantee Titian both the position and the senseria. Youth has no idea know how long life will be and this appears a crime of opportunity as much as it was a crime of deceit, unfortunately offered to one whose ambitions made that opportunity irresistible. Titian's ambitious traits in league with his tedious penny-pinching and fondness for arrangements-other-than-cash display the avaristic character that will always be associated with the aged Titian, and one can infer from his impatience surrounding the trials with Bellini and the Council of Ten that he was even in youth, ever hungry to secure his side of the bargain. Titian, now more than eighty years old can barely see the canvas let alone paint due to a shaky hand, and this claims the dealer, was known to all Venice. Titian's all-consuming drive for gain mark his character well into old age and so perhaps reveals ambitions and conceits that were very likely present in his youth. If Aurelio had conspired to remove the painting from the studio of the late Giorgione, Titian was certainly compliant with the situation and obviously willing to authenticate the Sacred and Profane Love with the Aurelio coat~of~arms. It is also not unreasonable to suggest that Aurelio would have had the support of numbers within the council willing to wrench the work from (possibly) Alfonso's grasp - albeit to Aurelio's own advantage. Why? At the time there was a hatred of Alfonso and his association with the league of Cambrai who had been at war with Venice. Strangely, Bertuccio Bagarotto, the father of Aurelio's bride Laura Bagarotto, was publicly hanged (wrongly) in front of Laura for suspected treason with the league. Was the Council wielding its retaliatory power in a hate driven pogrom against possible and even imagined traitors and had they wronged the Bagarotto family? Now there is motivation for a the son of a humanist (Aurelio) to right a wrong; recalling that the Bagarotto dowry (2000 ducats) was only restored to Laura the day before her wedding to Aurelio. What part did Aurelio's influence play in that restoration? There is still far more here than meets the eye. There are several reasons why the Sacred and Profane Love qualifies as the night. It will be argued that the painting is Ferranese in character; it is 'mens business' in that it was painted for a man and not a woman. Furthermore the Sacred and Profane Love is precisely the sort of work that distinguishes the deep seated nobility, wisdom and responsibility of a cultural elite from those that were merely wealthy and socially advantaged. We must also be prepared to acknowledge an idea by Giles Robertson - that Bagarotto may have had some involvement with the Sacred and Profane Love's programme - if so how could this have been intended to play out? Did Bagarotto have any connection to Ferrara, Duke Alfonso, and/or Isabella? The child (Cupid/Mercury/Hermes) of the Sacred and Profane Love returns to Giorgione as the iconological source; now to discover the prototype of this child, we must turn to the meaning of the murals on the Fondaco dei Tedeschi. Next post will be an alternative reading of the Fondaco dei Tedeschi murals.